Hi, I´m an English teacher from the Czech Republic. 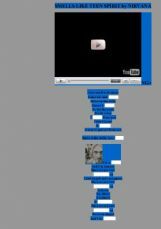 I really appreciate the possibility to create, share and get motivated on this site. 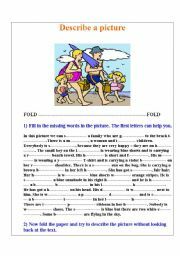 Students should first fold the handout and try to retell the story in the past simple.Then they can unfold it and try to fill in the sentences with regular and irregular verbs. 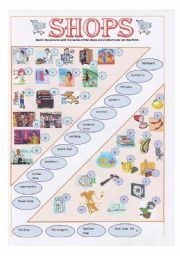 This picture description can serve for both young and adult learners to enhance vocabulary use but also speaking. 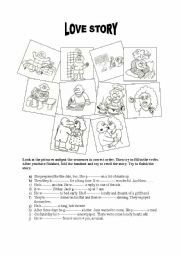 First students can fill in the missing words and then fold the paper and try to describe the pic without looking at the text. 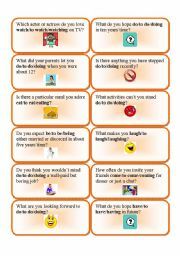 This activity can be used as a springboard for the PET speaking test - part 2. 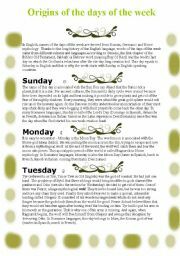 Reading about the origins of the days of the week may enhance interest in your students. There is a short discussion point at the end of the article to stir up imagination rather than check comprehension. Cards for practising first conditional, Ss are supposed to finish the sentences with their own ideas and the future tense. 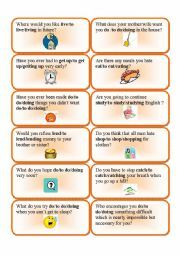 These cards are useful for both practicing verb patterns, because Ss have to choose the correct patterns before asking questions, and for speaking practice as well, as the questions elicit some communication. Worksheet with some basic types of shops and products we can buy there, Ss are supposed to match the pics and write the numbers and letters in the bubbles next to the names of the shops. 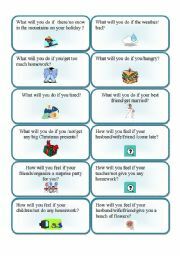 Can be used for elementary speaking, too. 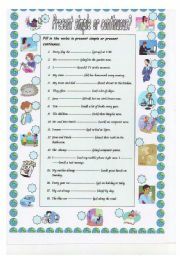 PET/FCE speaking test preparation, key included. 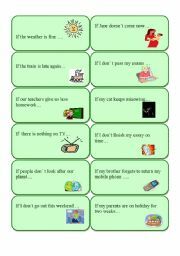 Cards for practising first conditional,on the first page the if-clause is to be made with the correct verb form, on the second page the main clause should be made from the prompts. A very easy exercise for kids aged 8-10 to revise the written form of basic vocab concerning furniture. Listening comprehension of the well-known song by Nirvana with three different kinds of exercises plus Kurt Cobain biography with comprehension questions.